Notification No. 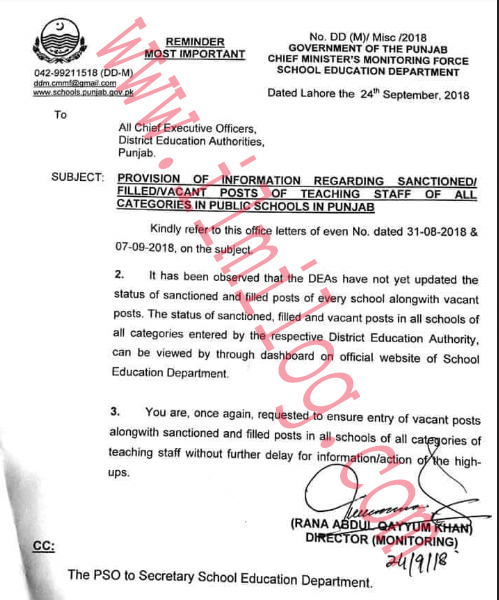 DD(M)/ Misc-2018 is issued by the government of the Punjab chief minister's monitoring force school education department on 24-09-2018 regarding Data in Public Schools about vacant Posts of Teaching Staff Punjab. All Chief Executive Officers District Education Authorities, Punjab. Compassionate refer to this office mails of even No. dated 31-08-2018 & 07-09-2018, on the subject. You are, once again, requested to ensure entry of vacant posts along with sanctioned and filled posts in all schools of all ca ones of teaching staff without further delay for information/action o e high-ups. Cc to the PS to Secretary School Education Department.